Come April 12, Facebook is planning to invite any and all publishers to participate in Instant Articles. “We’ve been building the tools to open up Instant Articles more broadly,” Josh Roberts, product manager at Facebook, said in a Wednesday blog post. The expansion of the mobile news-perusing service bodes well for Facebook’s nearly 1 billion daily active mobile users. For them, it means easier access to more news sources, and faster load times for everything from text to video. With Instant Articles, Facebook claims that mobile load times are 10 times faster than on the sites where the content comes from. For publishers, Facebook is offering them 100% of the revenue from ads they run inside the service, while taking a reported 30% of revenue from ads that it sells through the Facebook Audience Network. Less than a year old, the initiative appears to be thriving. Late last year, Instant Articles supported about 1,000 articles a day, from National Geographic to Time to USA Today. Critics have tried to warn publishers about the dangers of getting into bed with Facebook. Last year, Michael Wolff addressed the Faustian implications of working with Facebook in the MIT Technology Review, while Ezra Klein argued that once media brands surrender distribution control to Facebook, they’ll never get it back. Meanwhile, Facebook’s rivals are trying to develop legitimate alternatives to Instant Articles. 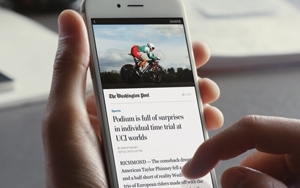 In partnership with Twitter, LinkedIn, and others, Google recently unveiled “Accelerated Mobile Pages.” The service promises publishers faster delivery of their content over mobile devices, and unlike Facebook’s offering -- and Apple News -- AMP is designed to work across multiple platforms, is open-sourced, and is available to any publisher who wants to participate. For Facebook, the expansion of Instant Articles is also part of an effort to further enmesh itself within the news-making business. Last year, the company made its Mentions and Live features available to public figures with verified profiles. Professional journalists and other public figures can now use Mentions and Live to reach Facebook users directly and interact with them in real-time. Also last year, Facebook rolled out Signal -- a tool for sourcing, gathering, and embedding content from its flagship network, as well as Instagram. As part of the effort, the social giant made it easier for journalists to find and use relevant data, including trending topics.